Prior to 1990 and before his death in 1994, Gatton played a 1953 Telecaster that he had modified heavily for better playability. In 1990, Danny's main guitar became a Danny Gatton Telecaster prototype based on the '53 built by Mike Stevens at Fender's Custom Shop. The guitar, serial number DG00001, featured early-model Joe Barden pickups, a stainless steel bridge plate, heavily knurled stainless steel knobs, and a 1 meg tone pot with a .05 capacitor to create wah effects. Other modifications included James Burton's autograph scratched into the front and raccoon prints on the back. 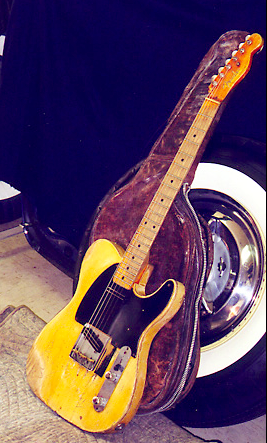 Gatton also played the first production model of his signature Telecaster, which he had modified by adding a center pickup between the stock ones.